Latest temperatures across NJ appear in the above map. 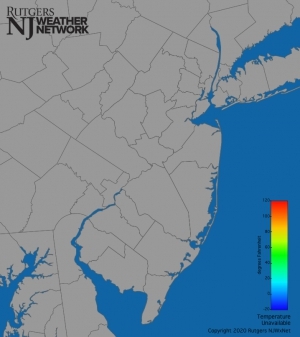 Click on the map or here, the New Jersey Weather Network, for much more information. Interested in becoming a volunteer weather observer? Click here to learn more about the CoCoRaHS Network! This state summary was produced to meet a demand for state-level information in the wake of the Third U.S. National Climate Assessment. The summary covers assessment topics directly related to NOAA’s mission, specifically historical climate variations and trends, future climate model projections of climate conditions during the 21st century, and past and future conditions of sea level and coastal flooding. Click on the above link to view a list of publications that focus on the weather and climate of a particular state or region. Included are 164 references for 42 states! The earliest is from 1847. Examine a century's worth of weather observations from locations around the state. Snow clings to the trees and ground in Stewartsville (Warren County) on the morning of March 4th. Photo by Dave Dabour. Much like last month, March 2019 had a wide variety of weather conditions across the Garden State. The month came in like a lion, with a week of wintry weather, which was particularly snowy in northern and central regions. 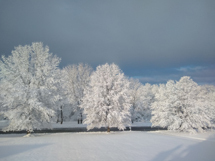 More snow fell than in any other month this season and the temperature fell below zero in one location and down to single digits at a number of others. The remainder of the month was often lamb-like, including four days with high temperatures exceeding 70° at many locations and six in the 60°s. Several inch-plus rain events occurred, along with the first lightning-filled squall line of the year, which, in some locations, included hail and strong winds. The statewide monthly temperature averaged 39.7°. This is 1.1° below the 1981–2010 average and is the 58th mildest (66th coolest) since 1895. The statewide average rain and melted snow totaled 3.91”. This is 0.20” below the 1981–2010 average. It was the 61st wettest (65th driest) March since 1895. Statewide snowfall averaged 6.3”. This was 1.9” above average. Northern counties averaged 13.0” (6.7” above average), the central region 8.6” (+3.5”), and south 1.6” (-1.5”). As a preview of the seasonal snow summary in next month’s report, statewide snowfall through March is 20.5”, 5.0” below average. Barring the unlikely case of April snowfall exceeding any other month of the season, this will mark the first time since records began in 1895 that March was NJ’s snowiest month of the season for three consecutive snow seasons (October–April).